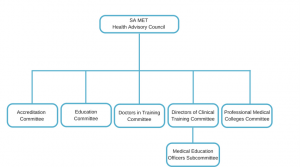 The South Australian Medical Education and Training (SA MET) Health Advisory Council (Advisory Council) was formed in 2013 as an unincorporated Health Advisory Council established by, and reporting to, the Minister for Health and Ageing in South Australia. SA MET has the key roles of developing education and training and the accreditation of postgraduate training posts in South Australia. These roles were previously undertaken by predecessor organisations, the South Australian Institute of Medical Education and Training (SA IMET) and the Postgraduate Medical Council of South Australia (PMCSA). The SA MET Advisory Council is supported by the SA MET Unit staff, who provide secretariat support for the council and manage the accreditation activities of the council. In addition the SA MET Unit undertakes a range of other medical education, training and workforce functions for the South Australian health system. These include internship applications and allocation, Trainee Medical Officer (TMO) applications and job matching, junior medical officer workforce planning, education support (workshops, e-learning and assessment) and research. 5 committees and 1 subcommittee sits under the SA MET Health Advisory Council. See the structure below.